Today my husband and I are celebrating our 9th wedding anniversary, we’ve almost made it to the big 1-0! A little over a week ago I was given the opportunity to write about our marriage over at Yes They Are All Ours. The creator of this blog features Marriage Mondays, and writes about particular helps for married women of all ages to be able to help your marriage in godly ways and teach your children to love and respect marriage. The blog is titled Persevering Through Trials. Click here to go to the article. She has allowed me to write about the ups & downs my husband and I have faced over the past 9 years. I have included 4 specific helps we have used to be able to make it through the stress and trials. 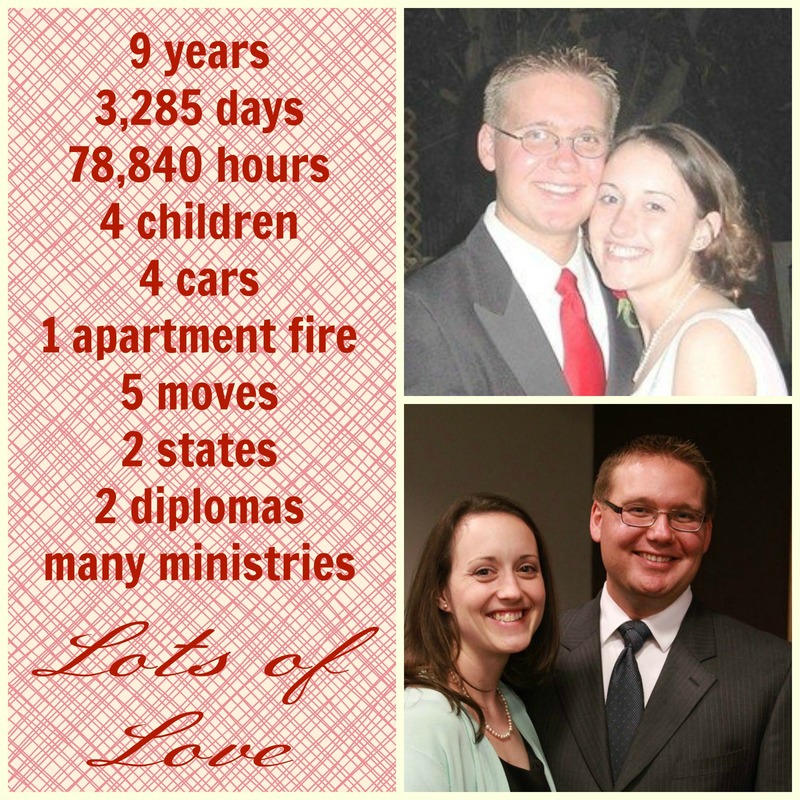 Did you know that we experienced a complete loss after our apartment caught on fire 2 months after we were married? Yeah… that’s only 1 of the stressful things we have been through together. But God has kept us and helped us along every step of the way. Go read about it! I wanted to introduce Elizabeth from Yes They Are All Ours and let you know a little more about her. She is a mother of 10 and blogs often about her life as a Christian woman, recipes their family enjoys, and just about any other thing a mother of 10 would write about. Right now she is in a new phase and situation in her life where she is trading off being a caretaker for her mother and having to leave her house full of kiddos and husband in another town. I hope that you will go and visit her blog and learn from her. She has great helps and insight as a woman of experience with many of life’s situations. I liked this blog she wrote about marriage about What To Do About All Those Warts, that your husband has. Thank you for allowing me to share this post with you, we’re not a perfect couple, as you will see but we do love the Lord and are striving to make our marriage better. While we are sad about the history of this day for the nation of America, we also are filled with love and joy for the marriage God has given to us! Where Have The Older Women Gone?